Does USA Now Mean The United States Of … Asterisks? No, even though Hillary Clinton received the most votes, she won’t become the first female President of the United States. It* happened to us yet again. In the good old USA, by necessity we have to use the term popular vote rather than a simpler term: vote. For the fifth time since the end of the Federalist Era, the person who won the popular vote lost the election. In the commentary offered by the punditocracy since election night, several media sages have pointed out that this country is the only place in the world where you have to qualify your statement about a presidential election result by using the term popular vote. Then there’s something else called the electoral vote. No, in this country we don’t just have plain old votes, but two varieties of them. But forget about that. Only one flavor of vote counts in the end. Welcome to the USA, the United States of Asterisks, where winners* lose and losers* win. In case you’re wondering, the * is code for the Electoral College, a peculiarly American term. Donald Trump was indeed right about something – the system is rigged. 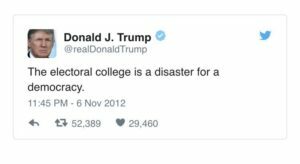 In 2012, he famously tweeted that “the electoral college is a disaster for a democracy.” Trump at least knew that when you determine the winner by using one vote count to generate another kind of vote, that’s where the ubiquitous American asterisk comes into play. We should be burdened by the ghosts of elections and Electoral Colleges past. Andrew Jackson, Samuel Tilden, Grover Cleveland, Al Gore, and now Hillary Clinton are forever enshrined in the American Asterisk Hall of Fame, where the winners are losers, exemplars of a flawed electoral system that is embedded in an 18th century constitution, designed by the Founding Fathers, many of whom determined to protect the “Peculiar Institution,” viz., slavery, by counting enslaved people as 3/5th of an individual to determine a state’s population. The population count, of course, determined representation in the House and the amount of a state’s electoral votes. Where else might you have come across reading about a 3/5th formula of any type in your lifetime? Standard kitchen measuring spoons typically start with a 1/8th and 1/4th measure. That makes a 3/5th measure for population even more peculiar. How appropriate to have such a peculiar measure for the “Peculiar Institution” that also formed the basis for measurement in the peculiar Electoral College. Many of us are stressed and depressed not only by the outcome, but angry at the fact that this undemocratic result has occurred twice in the last five presidential elections. If you look at the asterisks and quantify them, that constitutes a 40% “error rate,” where losers become winners. A 40% error rate, if we can use that term for this discussion, is unacceptable in a 21st century political system that, we hope, will last well into the future. One thing we must concede: before there was something called Trump University, there was something even more peculiar- the Electoral College. It’s indeed tragic that a fraud trial dealing with Trump University is moving forward in the courts, but the fraud on democracy known as the Electoral College continues to operate, offering admission to the presidency, while Trump University is defunct, no longer admitting applicants. We the People need to do something about this state of affairs. As a way to channel our anger and work even harder for structural changes in our demonstrably outdated and dangerously flawed 18th century electoral system, readers are invited to read or even re-read a series of articles on constitutional reform that appeared on these pages in January 2016. This writer authored the series, knowing that the 2016 election was fraught with danger. In light of the results, he takes no consolation in having some of those fears realized. Setting the stage: Are residents of U.S. territories second-class citizens, and what about that term “natural born” citizen? Our problems are much more than Citizens United – and while you’re at it, think twice about having another Constitutional Convention. The San Andreas Fault has been a problem in geologic terms. But in the United States, there are three other fault lines that endanger the stability of our republic. So what do we do about these problems that threaten the stability of our republic? Consider a Second Bill of [Voting] Rights: Amendments 28-30. Forget about interpreting the meaning of “natural born citizen.” We’re all in this together. Full U.S. citizenship (read Puerto Rico, Virgin Islands, Guam and other U.S. territories) should not be limited by zip code and place of residence. Consider a Second Bill of [Voting] Rights: Amendments 31-34. Again, Donald Trump was right. The system is rigged. This five-part series offers some ideas about how we can proceed with constitutional reform and a new Bill of Voting Rights, and we invite you to read and discuss these proposals. In the meantime, what are We the People going to do about our system of governance that suffers from a 40% failure rate? Happy reading! The best book on the “Stolen Election of 1876” is Fraud of the Century by Roy Morris. It was published in 2004, after the presidency was taken from Al Gore by the U.S. Supreme Court. If election reform finally becomes an issue after the 2016 debacle, those interested in the topic are encouraged to start their reading with this book. * Here are two organizations that are interested in some type of constitutional reform. We invite you to find others that will move us to form a more perfect union. As the full impact of this election is felt, there will be others. Ohio’s Tim Ryan Considers Run For House Minority Leader To Donald: The Mines Are Closed, Forever!